I have a thing for shipwrecks. Readers might remember that I lived on a boat, which sank. I have a tattoo of Shackleton’s Endurance sinking. Boats sink a lot in Burly Men at Sea. But unlike in real life, in the game I actually wanted my boat to sink, just so I could see what would happen. 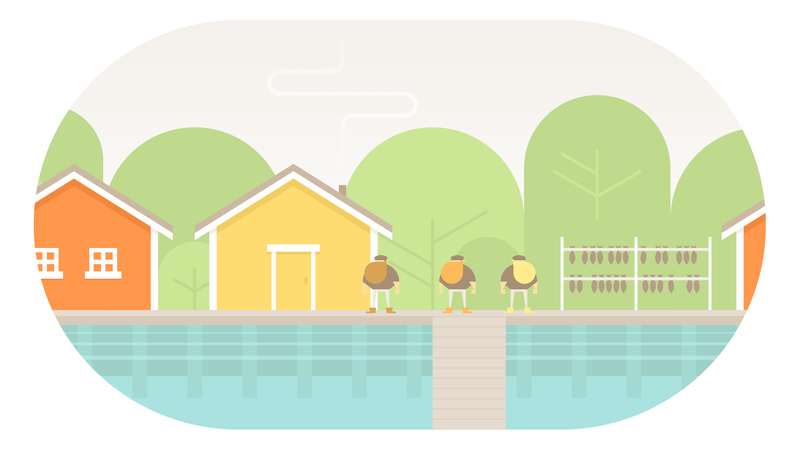 Burly Men at Sea is a narrative adventure game by husband-and-wife team Brain&Brain released today for PC, Mac, and mobile. It’s based on early 20th century Scandinavian folklore, which mostly comes out in its bright, simple architecture and strange creatures. Three brothers—archetypically named Brave Beard, Hasty Beard, and Steady Beard—find a map in a bottle and set off for adventure. Things don’t go as planned, and one disaster leads to another until they wash up on shore for another round. Interactions are fairly minimal. I played the game on my iPhone, and I spent most of my time pulling on the edge of the screen to expand the view and reveal things for the Brothers Beard to run afoul of. There are a few other things you can do—tug the jaws of a sea monster to open them, hold on a character to make them lose a race. I imagine playing on a computer might feel like overkill; Burly Men at Sea felt perfectly suited for mobile, both in terms of its mechanics and the length of each playthrough. You can’t see it in this screenshot but the paddling animation is adorable. My multiple playthroughs lasted anywhere from five to ten minutes, and there’s not a lot I can say about them without spoiling the surprise, which is a large part of the game’s appeal. Pursuing them one after another, however, revealed the storylines’ repetitive nature sooner than I would have liked. At the end of a journey the game represents your playthrough with mysteriously-numbered books on a bookshelf, and my shelf still has plenty of space left to fill, suggesting there’s more to explore that I’ve missed. By the developers’ own admission playthroughs are meant to be completed in one sitting, and I assume they aren’t meant to be played back-to-back. Burly Men at Sea’s greatest strength is its simplicity, and trying to force it to be bigger than it is would be missing the point. Burly Men at Sea evokes a strange world through its light touches: a basic but creative soundtrack (sound effects with voice feature prominently), a storybook writing style, and bare-bones mechanics. It’s a calming, lovely game, a great way to start or end a stressful commute. It left me with a little smile on my face and the thought that it would be a great game to read to my sister’s kids. I’m curious about the branching paths I might have missed, but I’m not desperate to get back to them. It’s a nice game to have in my pocket, ready to be dipped into, which isn’t something I usually say about shipwrecks.